Most Facebook users upload their photos directly from Facebook. If you want to speed things up and upload photos without logging into Facebook, use Easy Photo Uploader. 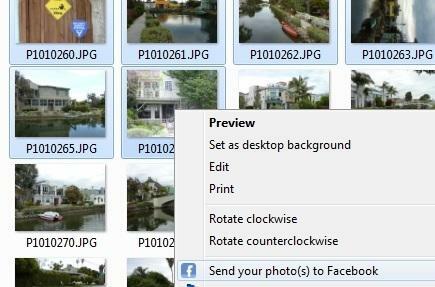 This tool integrates with Windows Explorer so you just have to right click photos you want to upload and click "Send your photo(s) to Facebook" from the context menu. This will automatically connects you to the linked Facebook account and allows you upload the photos to an existing album or create a new album. If you have more than one Facebook account, you can add them all and later select one of them when your uploading photos.